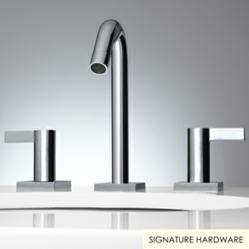 Signature Hardware’s Whittington Collection offers a stunning range of new faucet designs. Customers are sure to find a faucet design that suits their style and a finish that complements their décor. Signature Hardware introduces more than 20 extraordinary additions to their Whittington Collection. These new kitchen sink, lavatory faucets and tub shower sets are available in a remarkable range of designs and finishes. They are also constructed of solid brass for enduring beauty and functionality. The new Whittington faucets are available in centerset or widespread, as well as single hole and wall mount configurations to fit customers’ plumbing requirements. Shower faucets are available as tub and shower sets complete with slide bars and handshowers. Signature Hardware also offers teak bath furniture, shower rods, towel warmers, tub caddies, robe hooks and much more. For more than a decade, Signature Hardware has provided distinctive fixtures, lighting, outdoor décor, plumbing hardware and home accents. With a passion for customer satisfaction, we deliver outstanding products with expeditious shipping. Visit our Erlanger, Kentucky showroom or online at SignatureHardware.com. Full-color catalogs are available for free.